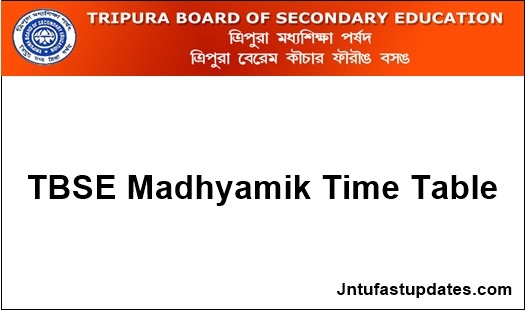 TBSE Madhyamik Routine 2019: Tripura Board of Secondary Education (TBSE) has released Programme for Madhyamik Pariksha (Secondary Examination), 2019, New Syllabus & Old Syllabus at tbse.in. The TBSE Madhyamik/ 10th class Examinations are going to be held in the month of March. The students gaining Madhyamik education from TBSE board can check the Madhyamik Routine 2019 from official portal, tbse.in. The Tripura Madhyamik examinations will be held in morning session. Students can go through the detailed TBSE Class 10th Exam schedule once after the time table released by the board. 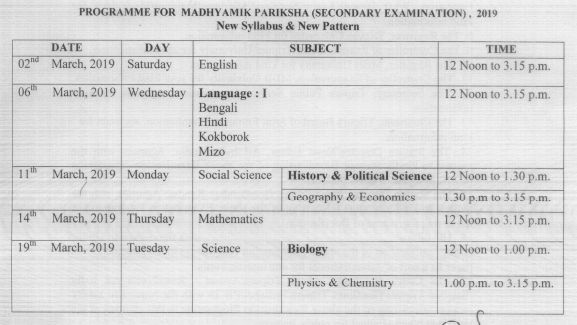 Students can expect the TBSE Madhyamik (Secondary Examination) Date Sheet 2019 in December month. By that time, students can keep visiting the official website for latest information. The Tripura Board of Secondary Education usually releases the Madhyamik date sheet in December month. Last year also the board has released the time table in December month. Usually, the end examinations will be conducted in March/April months and the results will be issued in May month. Students can fix that the same scenario will be repeated this year also. The exam dates, timings for all subjects will be mentioned in the date sheet. Also, the TBSE will announce the admit card release date and the result date soon. Keep visiting the TBSE Official website, tbse.in to know more updates. 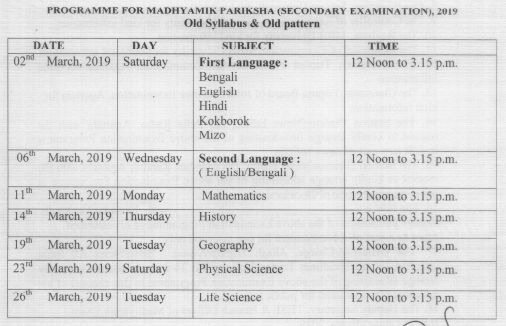 Tripura Board of Secondary Education has been published the Programme for Madhyamik Pariksha 2019 (New & Old Syllabus) on 11th December. As per Schedule Exams are going to starts from 2nd March to 26th March, 2019. Visit the TBSE Official website, http://tbse.in. On the homepage, TBSE 10th Exam Routine 2019 Link appears; Click on the Link. Wish my all brother’s sister best of luck. Best of luck of my all brother and sister.